Parks planners have designed a draft bike skills park plan for Bellevue Park, located at 3925 Paxson St. The project is awaiting funding at this time. The Master Plan for Bellevue Park is a result of a public process with the Southgate Triangle Neighborhood, which spanned the course of two years, dating back to October 2012. Input gathered from the public meetings helped guide the design process. The Master Plan was approved by the Neighborhood at the Southgate Triangle General Meeting on October 8th, 2014. Bellevue Park is a 7.8 acre, irregularly shaped, undeveloped park in the Southgate Triangle Neighborhood. Originally designated as a county park, the city acquired it through annexation. The primary features of the park are the Missoula Irrigation District (MID) ditch that runs through the western portion of the site, and the now abandoned Pattee Creek Drainage Ditch. In the late 1990s and early 2000s, the city improved the storm drainage flows in the area and rerouted Pattee Creek away from the area. At the same time, they also installed the large subsurface infiltration structure in the southwestern most portion of the park. There is small network of user defined paths that work their way through the park, as well as a small BMX bike area in the stand of existing cottonwoods. Within the past two years, the park’s maintenance responsibilities have transferred from the Conservation Lands Manager to the Parks Maintenance Manager. As a result, the park has received more frequent mowing (once every 4-6 weeks), which is more desirable to the neighbors, than the once a year mowing it was getting previously. There is an existing 35gpm well located in the southwest corner, which irrigates the medians on 39th street between Paxson Street and South Russell Street. The Master Plan for Bellevue Park was driven by the neighborhood’s strong recommendation of a low level of development, or a Level of Service (LOS) of 3 to 4, based on Park Standards. It was also important that the park be economically feasible to build and maintain. The desire of the neighborhood is to establish a low growing, non-irrigated, drought-tolerant grass mix that would out compete the invasive weeds that have crept into the park. The abandoned Pattee Creek Drainage Ditch will be filled in with adequate soil to eliminate potential hazards, as well as making the park easier and safer to maintain. A 1.5” irrigation mainline, serving drip to the proposed trees, should be installed in the ditch prior to filling. The fill should be graded to still allow surface drainage along the previous ditch alignment. There are also a number of invasive Golden Willows along the ditch alignment that will need to be removed and treated. A meandering five (5) foot wide, soft surface path will run the length of the park, from the northeast to the southwest, with loop options on both ends. There will be multiple bench locations along the path, in both shade and sun locations. 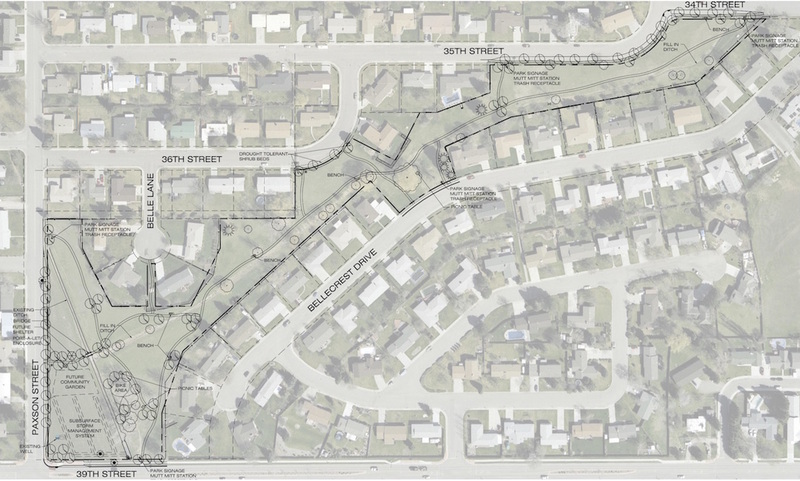 As part of a separate project, Public Works installed curb, gutter, and detached sidewalks on the 34th St., 35th St., 36th St., and Paxson St. frontages with direction and input from the draft master plan. Parks staff will begin phasing in boulevard street trees along all the above park frontages and within the park. Small drought tolerant shrub beds are placed along the frontage of 36th Street. These small beds would be adopted by interested neighbors for the planting and maintenance. Additional beds could be developed, based on interest in the community. The existing well on site may be used to drip irrigate the tree plantings and shrub beds, but the capacity of the well would not be sufficient to irrigate the entire site as turf. The addition of a small footbridge, across the MID ditch will improve access from the Paxson Street frontage. There is a potential to use a 20’ bridge, which is currently in storage, previously used to cross Rattlesnake Creek. This access from Paxson Street is also the location for a Future Shelter, Community Garden, and Port-o-let Enclosure. The feasibility of the garden in this location will be researched by Garden City Harvest, who would also be responsible for management, maintenance and water needs of the garden. The existing BMX pump track area will be enhanced, with the kids still being able to alter and “dig in the dirt.” The stand of Cottonwood Trees will be inspected again for health. Many of these trees have had dirt backfilled around the bases, and will need to be watched for health and safety. New trees will be phased into this area to maintain a shade cover. Park Signage will be placed at both 34th Street and the corner of 39th Street and Paxson, identifying it as Bellevue Park. Park Rules signage, Mutt Mitt Stations, and Trash Receptacles will be placed at the entrances to the park. A number of picnic tables will be supplied on site, and be allowed to move around per user needs. The approximate extents of the Subsurface Storm Management/Infiltration System is shown on the plans. Development is limited on top of this structure. There are a couple instances of encroachment into the park by adjacent property owners that will need to be addressed. Funding is not currently available for plan implementation. Possible options may include park impact fees (there is minimal new development in the area), Land and Water Conservation Fund and Recreation Trails Program grants, and City general and park district funds.